Passion, courage and determination burn brightly in Minna’s second adventure, from a classic author. Set in a beautifully atmospheric Roman world, this classic story will enchant girls looking for action, adventure and romance. With internet links to find out more about life in Roman Britain. When Minna’s true love Theo leaves the lonely fort of Othona for the big city, Minna cannot bear to be left behind and steals away on her beloved pony, Silva, to follow him. But she has no idea that her actions will condemn Theo to fight a deadly duel – with her life as the prize. I enjoyed parts of this story but I am not that keen on books set in the past. I liked the fights and the adventurous stuff, but I wasn't too sure about the things that were happening because of when the book was set. This would be a great book for someone who likes reading about the past and likes an adventure story. "No Turning Back" is the second in the fantastic Roman Pony series by K.M. Peyton. 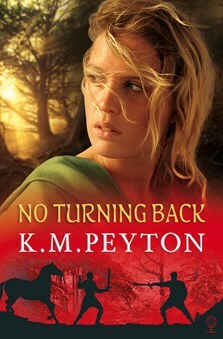 Set in Roman Britain, "No Turning Back" follows the exploits of daring heroine Minna as she runs away from her home, on her beloved pony Silva, to an exciting and dangerous adventure.